State Senate President Pro-Tem Ben Altamirano, who was elected to the state Senate in 1970 (when I was a senior in high school!) died the his home in Silver City. He was 77. The Associated Press had no details of his death Thursday night. I'll miss Ben. He was always a gentleman who treated people with respect. 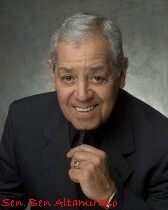 "I am deeply saddened by the passing of a great New Mexican and my dear friend, Benny Altamirano," Governor Bill Richardson said. "Benny was a true statesman whosesoft-spoken demeanor and love for the state of New Mexico helped earn him the respect of everyone who crossed his path. Benny will be dearly missed. Barbara and Isend our condolences to Benny's wife, Nina, and his entire family."